While we wait to see what the weather event will do for / to the lakes over the next 24 hours take a moment to read the following email and take a look at the photo. This gentleman is psyched to have this boat and is wondering what exactly it is! I have to say I’m also curious as to what the building was used for. In any case email me at t_thieler@yahaoo.com if you can identify the boat. Winner gets bragging rights! 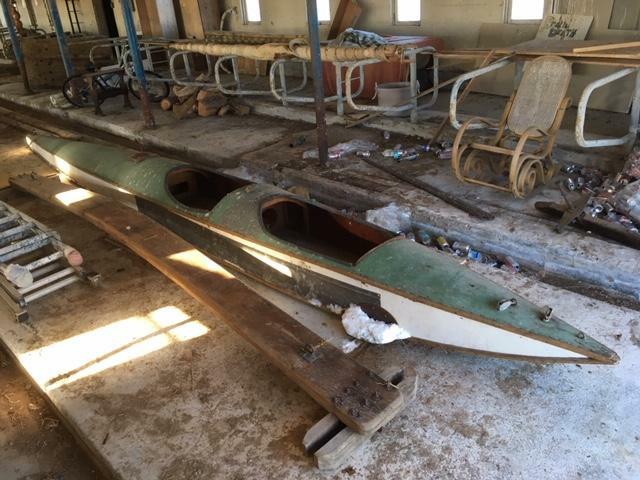 “I recently became the owner of this boat below and I was wondering if you have any idea how old it is or any other information on it. It has a wooden mast and the boom and sail is visible behind it on the pipes. The cross brace/leg goes in the rear and the steering runner attaches at the front with a large bolt. Any information would be appreciated. This entry was posted on 12/28/2018 by Commodore James "T" Thieler DN US 5224. It was filed under 2018 Season . Looks like a Palmer tandem skeeter from the 1930’s. It is sitting in a cow barn. Very cool boat. No idea what it is. But, I think the building was a cow barn. Its a double cockpit Mead Glider A skeeter.